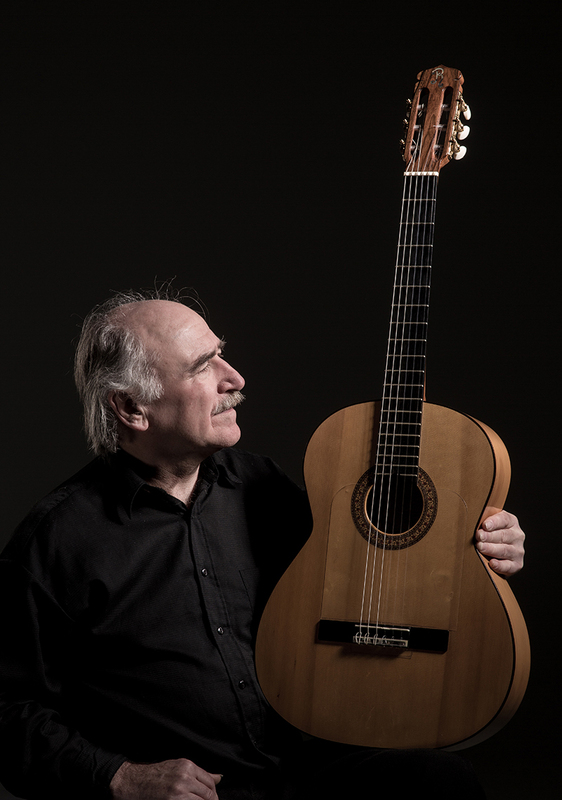 During my life hundreds of guitars crossed my path I always was very curious about the instruments of all the great guitar players like (classical) Andres Segovia: Ramirez I & II, Hauser, Fleta, Romanillo (Madrid). 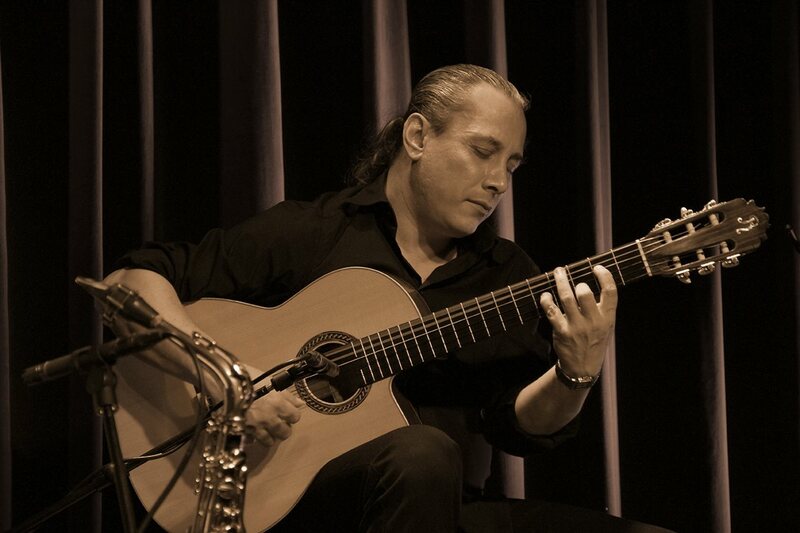 (Gipsy Jazz) Django Reinhardt: Selmer, Favino. (Jazz) Joe Pass: Gibson ES175D Archtop. 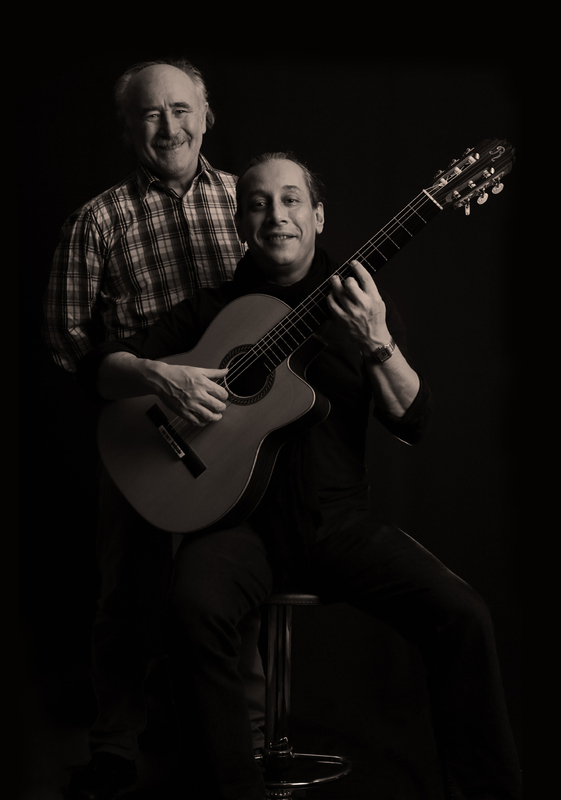 (flamenco) Sabicas: Marcelo Barbero, Ramirez I & II. During my career I was very fortunate to own several of these instruments. 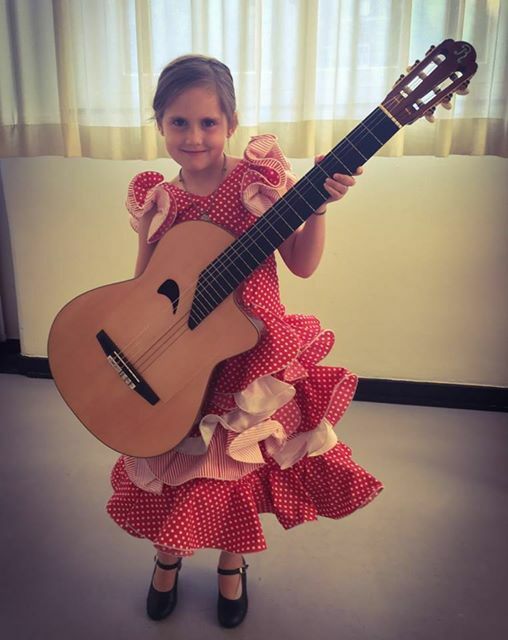 I own/owned Ramirez II & III classical and flamenco, a dozen Hermanos Conde (Media Luna), Domingo Esteso, several Gerundinos, an Andres Marvi Negra Rio, a great Francisco Barba blanca from Sevilla, etc. Furthermore I have/had several Archtops, some vintage acoustic Martin & co and Gibsons besides my wild youth were I played several Stratocasters, Les Paul's etc. 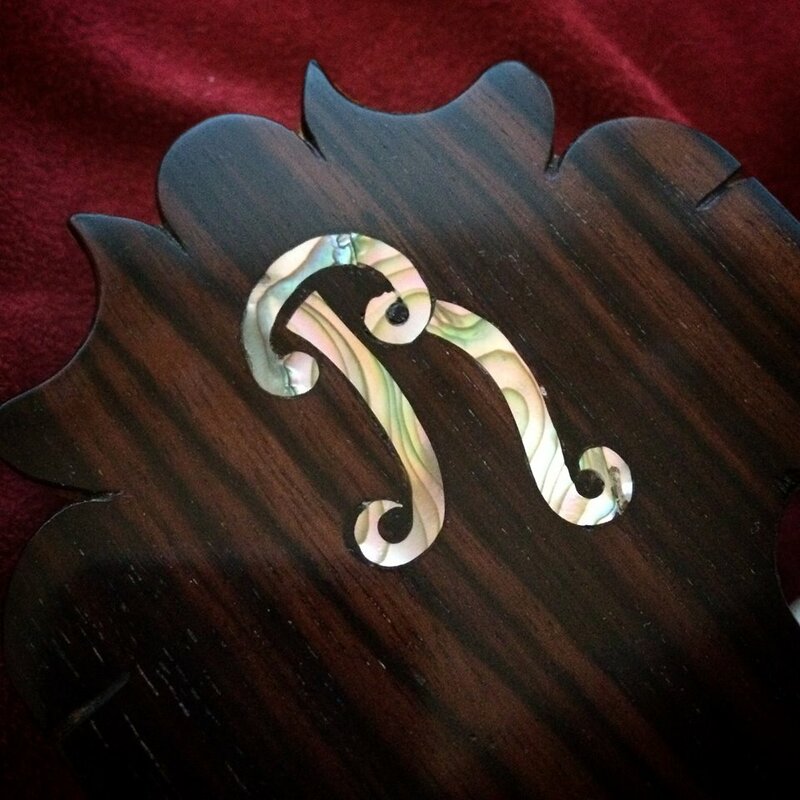 I also have/had a collection mandolins, banjo's, charango's, lutes and several exotic string instruments. 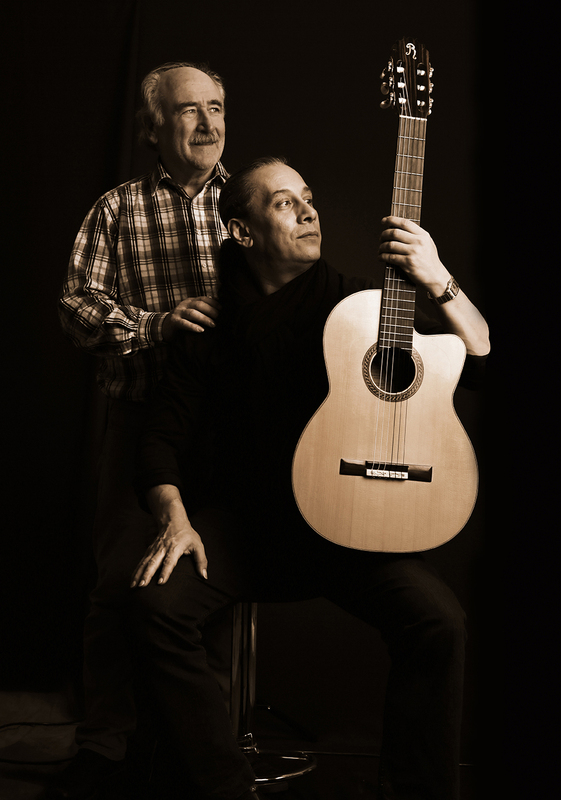 I was co-founder of the guitar company La Sonanta in Belgium. 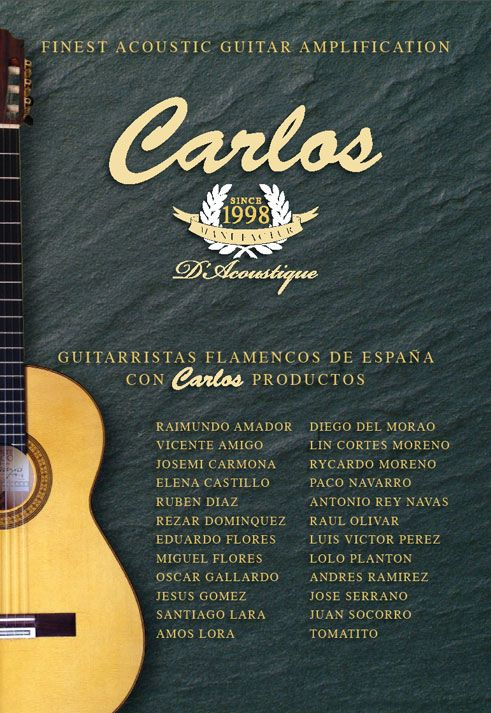 Besides making dvd productions and transcribing books, I was responsible for the contact with all of the Spanish luthiers and the distribution of their guitars in our store and webshop. 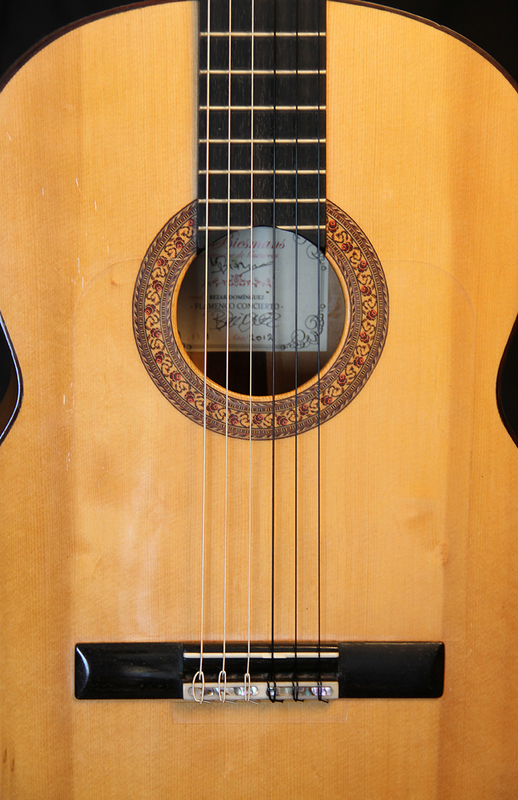 I started these guitars with HD videos on our website and Youtube in the form of guitar lessons. So here again I was very lucky to try all of these magnificent instruments (keeping the jewels!) 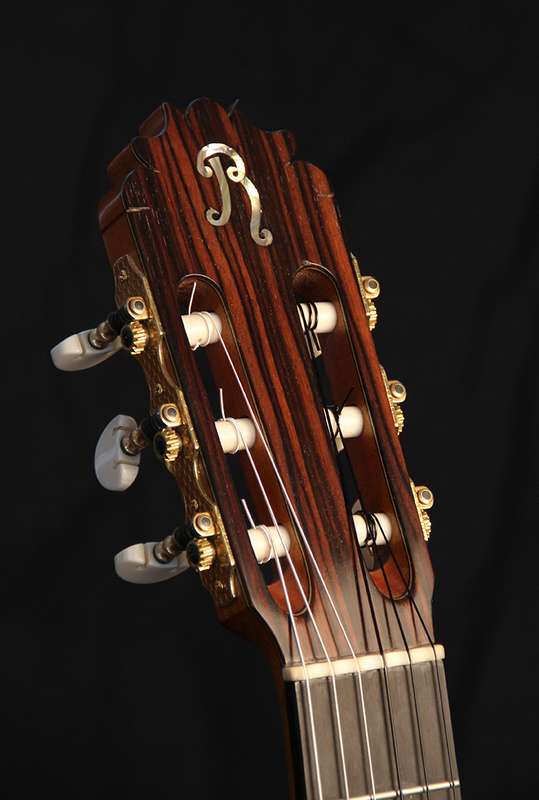 and therefore I have some firsthand experience with quality guitars. The more I understood about different kinds of wood and different kinds of building, the less I often understood of the quality-price ratio. 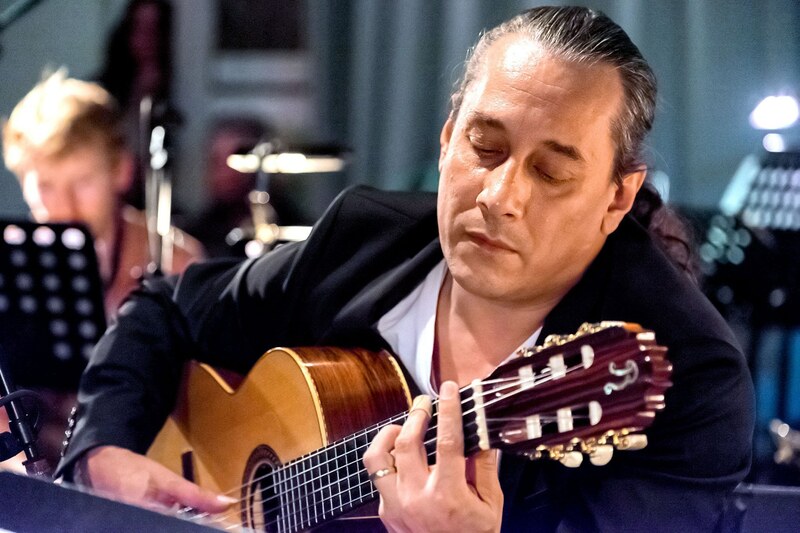 I saw several magnificent flamenco guitars of other guitar builders, even outside of Spain, like Vasilis Lazarides (Greece), Erez Perelman (Israel) and Jo & Martin Biesmans (Netherlands) and their guitars cost half or one third. 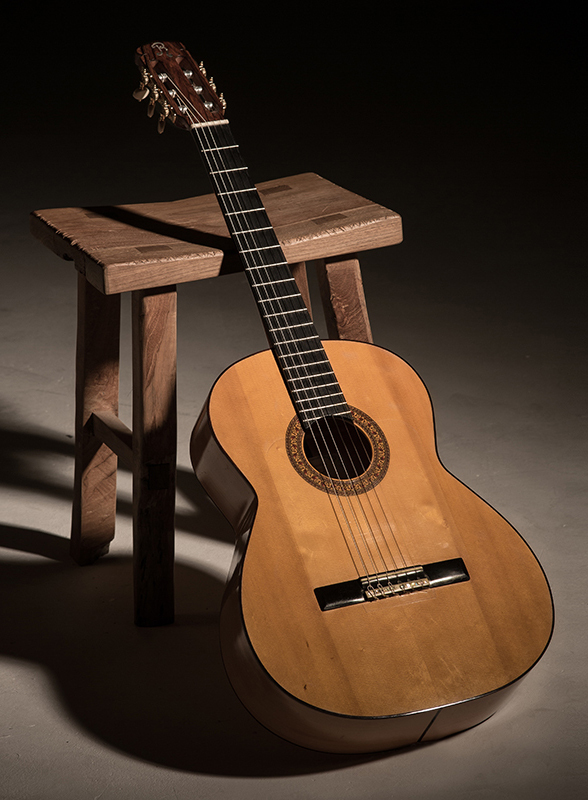 Let's be honest, to build a guitar a luthier needs an average of 250 hours to build a guitar. He has the costs of the materials, so I understand the 3000-5000 euro range. But 10.000 euro and over??? I must be honest, I couldn't blindfolded tell the difference between a good built 3000 euro guitar and some expensive brand 10.000 euro guitar. 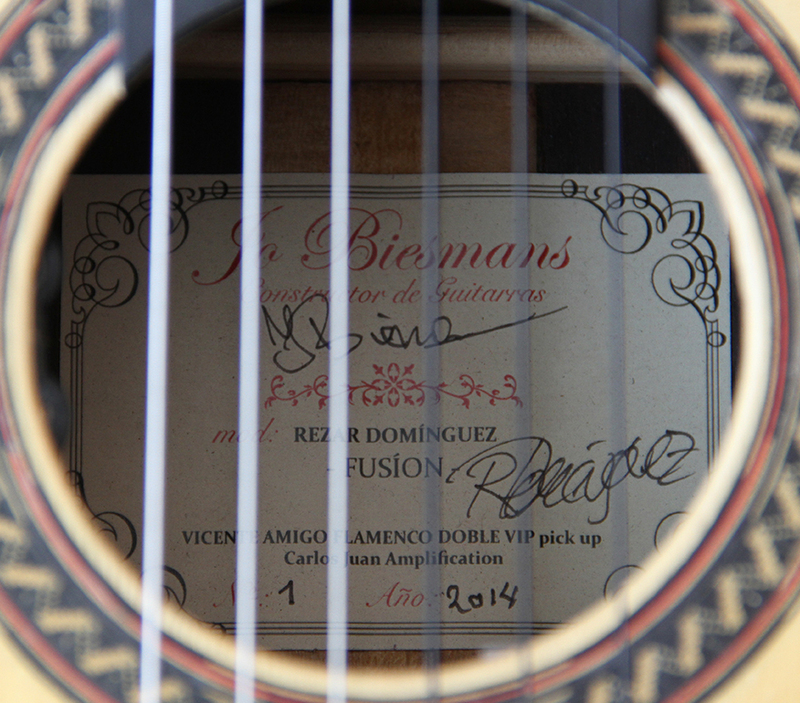 Playing model: "REZAR DOMÍNGUEZ FUSION"
I've had many of these discussions with my good friend masterbuilder JO BIESMANS and he totally agrees in my view. Together we developed three different signature models. And Jo manages to do this within the 2000 euro range! 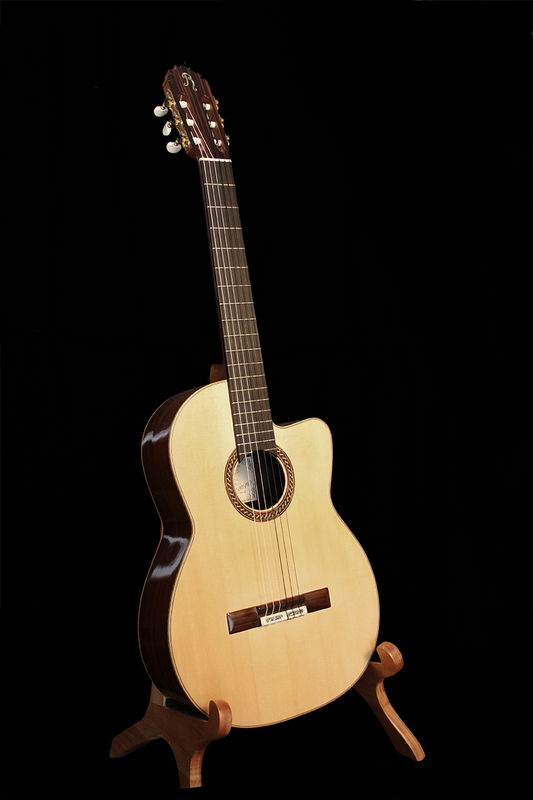 This means a fully hand built guitar from the best woods, fully French polished. 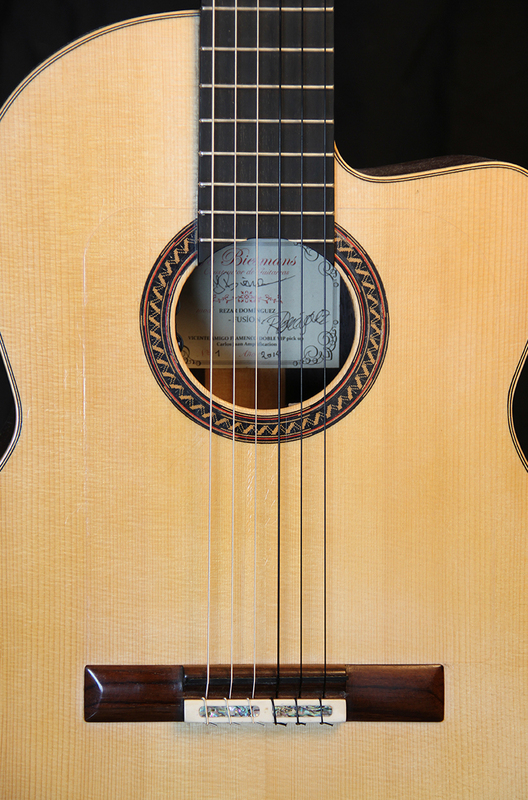 And imagine you can get a guitar completely measured to your size. 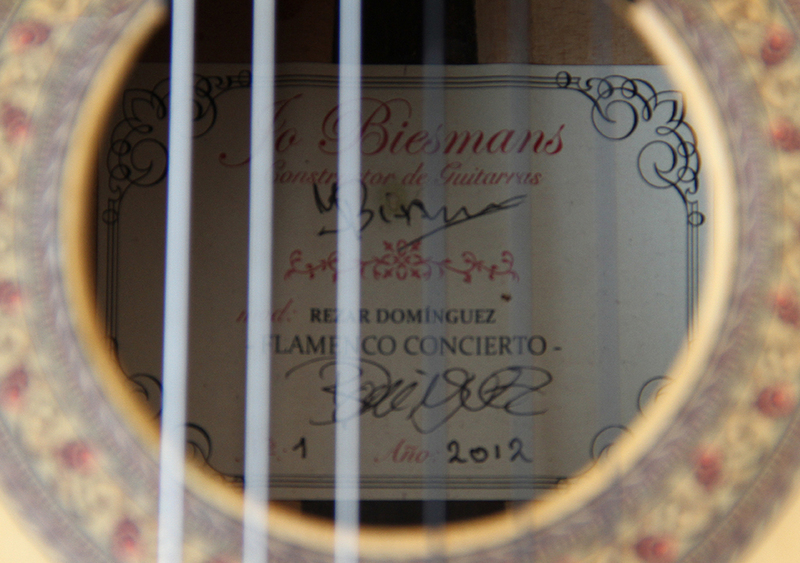 After my long journey through the world of guitars, I nowadays exclusively play my concerts on my JO BIESMANS signature guitars. They sound great, play very comfortably and look sooooooo nice!!! 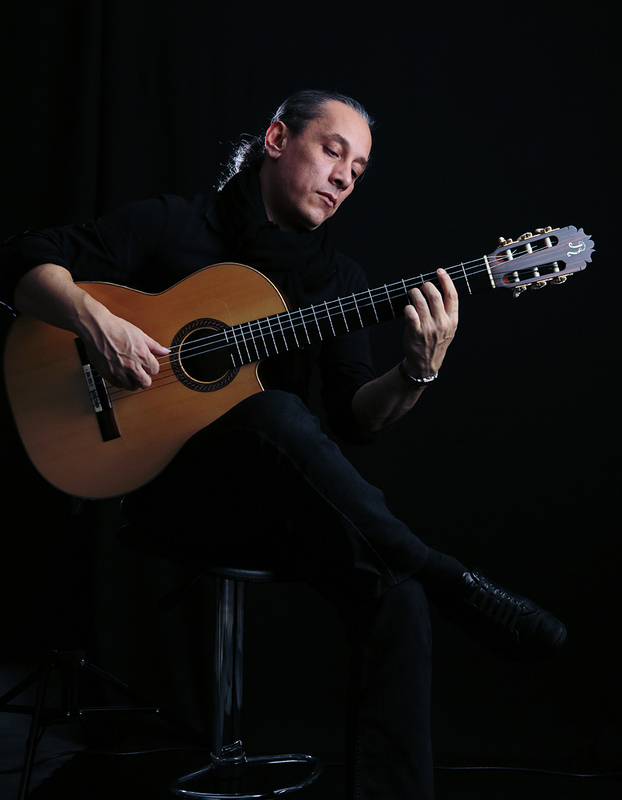 For amplification I'm happy to use the wonderful FLAMENCO DOBLE VIP pick-up from my good friend Juan Carlos. 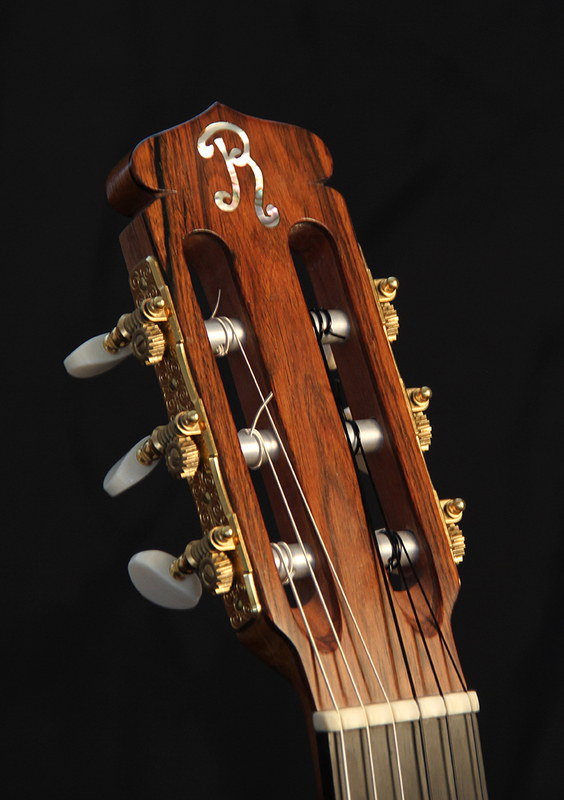 Which is also used by VICENTE AMIGO, TOMATITO, ANTONIO REY, DIEGO DEL MORAO and many others. For more info please contact Carlos ... or me.